We are excited to provide the latest in breast cancer PREVENTION with 3D digital mammography technology with reduced radiation exposure technology. 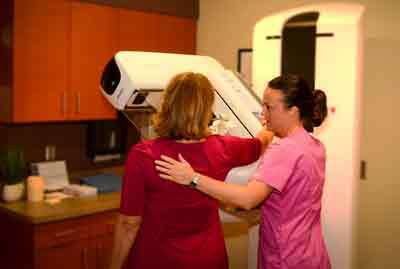 Screening mammography can detect cancers as early as two years before a cancer can be felt. The amount of radiation from a screening mammogram is less than that received from spending a day on the beach. Saunders Medical Center offers mammography with a Radiologist (doctor specialized in reading x-rays) on site for immediate interpretation and same day Ultrasound availability. Our facility is an FDA, MQSA (Mammography Quality Standards Act) and ACR (American College of Radiography) licensed and accredited facility. When Should I Schedule a Screening? Annual screening mammograms are recommended for all women age 40 and above and those age 30 and above with a family history of breast cancer. Breast cancer is currently the second most common cancer in women. Research shows that one in 33 women will be diagnosed with breast cancer and will not survive and 98 percent survival rate after five years for breast cancers diagnosed early. The entire exam takes less than 15 minutes. Your mammogram will be done in our mammography suite. You will be asked to undress from the waist up and provided with a comfortable gown that opens in the front. It's My First Mammogram....I'm Just Not Sure About This! Click Here for First-Timers. A female technologist positions the breast by resting it on a small platform and then gently compresses the breast with a plastic compression paddle. The purpose of the compression is to flatten the breast as much as possible. Spreading out the tissue makes abnormal details easier to visualize with a minimum amount of radiation. The pressure of the compression can be uncomfortable or even slightly painful. It helps to remember that each X-Ray takes just a few moments--and it could be life saving. Schedule your mammogram when your breasts will be least tender, approximately one week after your period. Please consult your provider to determine if you meet criteria for these procedures. On the day of the test, do not use deodorant, powder, perfume, lotion or cream under your arms or on your breasts. These products may interfere with the X-Ray results. If you are pregnant or think you may be, tell your doctor and the technologist before the exam. Please stop by the admissions desk 15 minutes prior to your scheduled appointment. We look forward to serving you!